AT&T has announced yet another 4G LTE Windows Phone, the Samsung Focus 2 which looks exactly like the SGH-i667 "Mandel" we saw this weekend.. The Focus 2 will be available May 20th in pure white for $49.99 after contractual discounts. The Focus 2 will run $399.99 off contract. Spec wise, the Focus 2 sports a 4" Super AMOLED screen, 5 megapixel camera with 720p video capabilities, front facing VGA camera and is 4g LTE compatible. The Focus 2 measures only .43 inches thick and weighs in at 4.3 ounces. 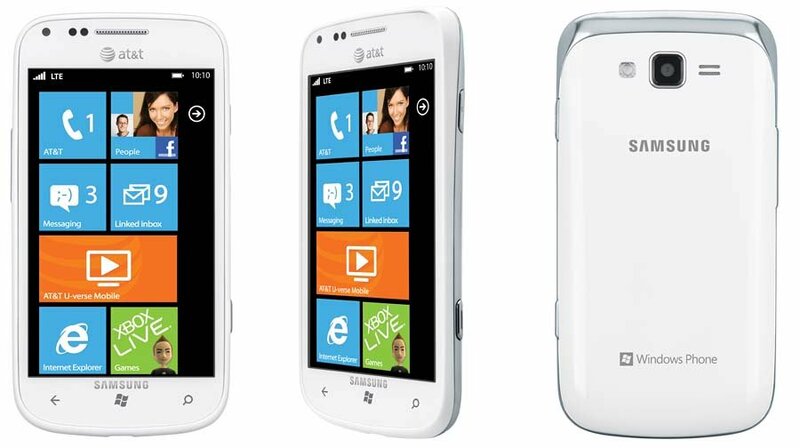 The Samsung Focus 2 joins the HTC Titan II and Nokia Lumia 900 on AT&T's 4G LTE Windows Phone lineup and presents customers with an economical entry point for the Windows Phone experience. You can catch the full press release on the Samsung Focus 2 after the break. The Samsung Focus® 2, an affordable Windows® Phone on AT&T’s 4G LTE network, will be available from AT&T beginning May 20 in pure white for $49.99 with a two-year service agreement. With the launch of the third Windows Phone smartphone on its 4G LTE network, AT&T continues to offer customers the most robust Windows Phone portfolio of any carrier. As Samsung’s first 4G LTE Windows Phone, the Focus 2 is sleek and stylish. Measuring 10.98mm thin and weighing only 4.3 ounces, it fits perfectly in your hand, purse or pocket. In April, AT&T launched the first 4G LTE Windows Phones in the world with the Focus 2 marking the carrier’s third 4G LTE offering on this operating system. AT&T customers have access to the nation’s largest 4G network, covering over 260 million people. As 4G LTE expands, AT&T customers are able to enjoy a widespread, ultra-fast and consistent 4G experience on their compatible device as they move in and out of LTE areas. AT&T has two 4G networks that work together for customers, LTE and HSPA+ with enhanced backhaul. With other carriers, when you travel outside of their LTE coverage area, you’re on a much slower 3G network. Beginning May 20, customers can purchase the Focus 2, available in a glossy pure white, from AT&T for $49.99 with a two-year contract.